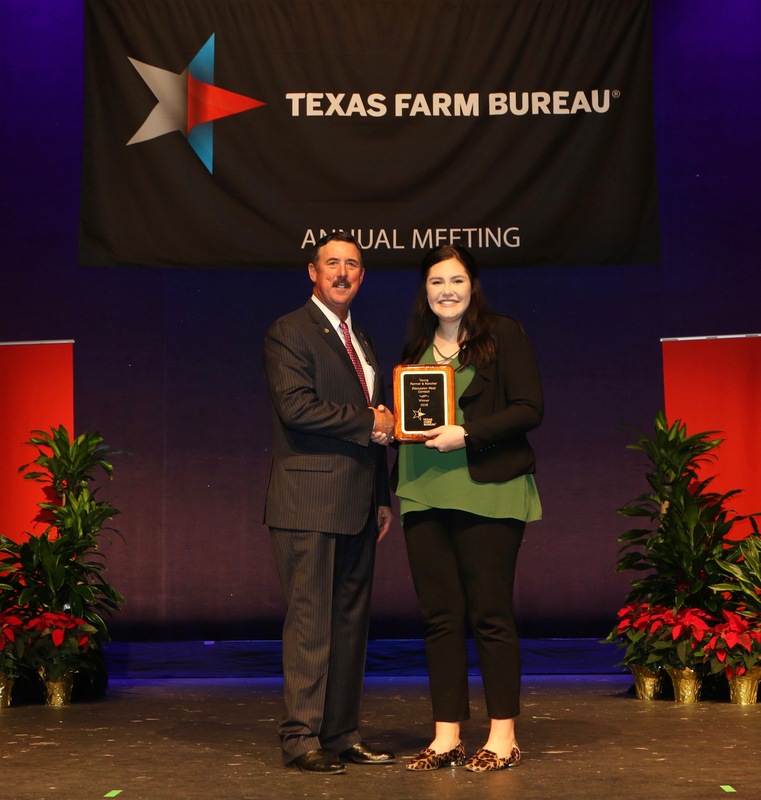 (CORPUS CHRISTI, Texas)—Madalynn Kainer of Victoria County won the 2018 Texas Farm Bureau (TFB) Discussion Meet during the organization’s 85th annual meeting. Kainer is the marketing and sponsorship development coordinator at the Heart O’ Texas Fair & Rodeo and Extraco Events Center. She grew up on a row crop farm in Victoria. She attended Texas A&M University, where she received her bachelor’s degree in agricultural communications and journalism. While at Texas A&M, she was a member of the 2015 Meat Judging Team and an Undergraduate Research Scholar. She is also an adult volunteer with McLennan County 4-H and a committee member for the Houston Livestock Show & Rodeo’s Junior Commercial Steer Contest. During high school, Kainer attended TFB’s Youth Leadership Conference in 2011. TFB’s Discussion Meet encourages problem solving through cooperative discussion among young farmers and ranchers. The finalists held a 25-minute conversation and were scored based on their speaking skills, effective problem solving and cooperative communication with other contestants. Kainer will receive an ATV, courtesy of Southern Farm Bureau Life Insurance Company, and a $5,000 cash award, courtesy of Farm Credit. The Discussion Meet finalists were Shannon Bellis of Van Zandt County Farm Bureau, Ryan Colville from Lynn-Garza County Farm Bureau and Josh Ritchey of Erath County Farm Bureau. The three finalists will receive a $500 cash award, courtesy of Southern Farm Bureau Life Insurance Company. Kainer will represent Texas in the national Discussion Meet contest hosted by the American Farm Bureau Federation. The winner of the national contest will receive a $35,000 credit toward a Ford Truck, courtesy of Ford Motor Company. The national runner-up will receive a Farmall 50A tractor, courtesy of Case IH. The third national finalist will receive a $500 Case IH parts card and combination roll cabinet and top chest, courtesy of Case IH. They will also receive $2,000 worth of Stanley Black & Decker merchandise, courtesy of Stanley Black & Decker. The fourth national finalist will receive a $500 Case IH parts card and combination roll cabinet and top chest, courtesy of Case IH. For more information on young farmer and rancher activities, visit www.texasfarmbureau.org/YFR. Madalynn Kainer is the winner of the 2018 Texas Farm Bureau Discussion Meet. Texas Farm Bureau President Russell Boening presented the award during the organization’s 85th annual meeting in Corpus Christi.